7 Wonders: Cities is an extension of the award-winning 7 Wonders game. For an added challenge, you can play all three versions together – 7 Wonders, 7 Wonders: Leaders and 7 Wonders: Cities. Far from the pomp of palaces and gardens, in the darkest alleys, gold changing hands, exchanging information, alliances are formed and secrets are betrayed. This extension provides a new family of cards that complements Ages already existing in 7 Wonders. Now, mercenaries, thieves, spies and diplomats will give a new scale to your cities. Reap the benefits by sowing discord among your opponents, play them off each other and push them into debt. Ability to play with up to 8 players! A gameplay and component overview with final thoughts on the game by Kaja Sadowski and Joanna Gaskell. “Cities” is the second expansion for 7 Wonders and should ultimately rank as an immediate purchase for any fan of the game. Like most great expansions, “Cities” does not alter a winning formula; instead, it offers more of the same and thereby helps to refresh a game that for many may have grown a bit stale due to the number of times it has been played. a) Two new Wonder board representing Byzantium (rewards diplomacy over warring) and Petra (rewards money collectors). b) New “black” cards that will mean you ultimately pass and play 8 cards rather than 7 in all three rounds. These black cards do represent some power creep as they are generally more potent than other cards of the age but they do not ultimately throw anything out of balance. c) Some additional Leaders that can be added to your leader selection. Many of the new Leaders play off of the new “black” cards. d) This expansion allows playing 7 Wonders with 8 players (although with 8 the intention is for you play as teams – see below for details). a) Diplomacy Achievements: When awarded a diplomacy marker you skip out of the battle phase for that age leaving your two neighbors to duke it out as if you were not there. This can lead to some interesting situations as two players who did not think they had to worry about each other suddenly do. b) Many of the black cards force all of your opponents to pay money to the bank or suffer a victory point penalty if they cannot. This is a nice feature as it forces players to be a little more thoughtful with their cash. c) As indicated by “a” and “b,” “Cities” allows for more interaction with players. Things still can’t be considered truly aggressive, but you do have to be more aware of what your neighbors (and occasionally others) are doing. In addition to diplomacy and forced payments, there are also cards that allow you to spy on the technology cards of your neighbors giving you access to their scientific symbols. d) Team Play: When playing with 4, 6, or 8 players you can now play as allies. You get to see each others cards and while you cannot share them you can strategize as to what to select and to pass in order to maximize each of your city’s points. This is an outstanding way to teach new players the game without boring veterans. If you are going to buy only one expansion for 7 Wonders I would go with “Leaders” over “Cities” but ultimately I recommend buying both. “Leaders” adds more depth to the game than does “Cities” but “Cities” refreshes all areas of the game with new cards, new boards, and it facilitates team play which is ideal for teaching new players. It provides a lot of bang for the buck while maintaining what you already love about 7 Wonders. 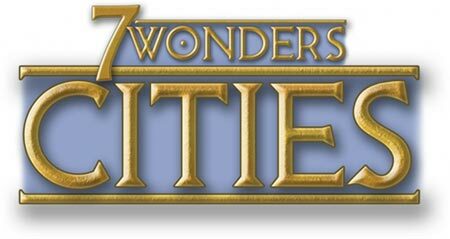 7 Wonders Cities is the second major expansion to 7 Wonders after “Leaders”. This expansion adds new “city” cards that mix up the gameplay a little bit, and allows players to affect other players across the table besides neighbors. Also, it doesn’t really add much to the overall game length either which is a big plus with how tight the base game plays. So get your toga on, and let us explore the cities of the seven wonders! Adds more interaction with debt and peace. This won’t cover the gameplay of the base game. Feel free to see reviews on it located here. In this expansion, “city” cards will be randomly mixed into the appropriate age decks to add an “8th” card of play to the game. The three biggest additions are the cards with “coin”, “dove”, and “mask” icons on them. Coin icons – when played, everyone must pay that amount of coin to bank or take on debt tokens for each coin not paid. This mechanism affects everyone except the person who played it, and those tokens stick with you to the end of the game and subtract victory points. OUCH! Dove icons – when played, a player grabs the dove token and places it in front of his or her play area. At the end of the age the token is placed, that player takes no place in conflicts, but their neighbors fight against each other. So if I’m pursuing peace and my neighbors are not, I can make them fight against each other and skip over me. Mask icons – when played, a player may choose which science symbol to copy from their neighbor at the end of the game. This is a great way to support the science strategy even if your neighbor is taking most of the science cards. Also, this expansion allows for up to eight people to play, or to break up into two teams of four. I haven’t tried either of those yet, because I rarely have seven other people to play with me. I really really like this expansion. It tweaks the base game with enough options to make for some interesting strategic decisions, and it doesn’t really add that much to the overall play time. I like how it adds some interaction with people across the table instead of just your neighbors with the addition of coins, but, it does enhance the interactions even more with your neighbors through the masks and dove symbols. If you want to pursue peace more, you now can do that now with the dove symbols. I also like how the coin cards add a little more theme to the “underbelly” side of a civilization based on the artwork. If you enjoy 7 Wonders, this is no-brainer of a pick. If you have more eight people who play regularly, then the eighth person won’t be left out anymore. Get it! It’s good! Family Gamer – YES – If your family is already familiar with the base game. Casual Gamer – MAYBE – only if they already know the base game, don’t introduce it with this expansion. Strategy Gamer – NO – nothing to improve deep and long term strategy here. Avid Gamer – YES – just makes it better. The kids at Asmodee and Repos really know how to make an expansion. The trick is to add new color and variety to a game, without changing the core rules or bogging the game down. 7 Wonders: Cities does this very well. * New feature: Debt. Many of the new cards make your opponents lose money. If you don’t have enough to pay the bank, you take debt tokens in the amount owed. The big drawback? You can’t pay the debt off AND each debt point is a negative VP. That’s right – it’s effectively 200% interest with no chance of paying it off. Yikes? * New feature: Diplomacy. Several cards and board features provide the player with a diplomatic token. This token remains on your board until the end of the next military conflict. If you have a diplomacy token, you don’t take part in the conflict. Your neighbors to the left and right fight one another as if you aren’t there. Handy! * It does increase the time needed for setup and clean up. * Some of the balance may be off. One card lets you build Wonder levels without the required resources. Yikes. * We find that it does increase the pondering time a bit each hand, but that’s to be expected. With 7 Wonders: Cities you get to add not only two new Wonder boards, but an extra card each phase. The new black cards change the strategy quite a bit with their influence on coins throughout the game. Players can now go into debt, which might happen if your coin supply is low when somebody plays a coin loss card. And those debt tokens can’t ever be removed. So you need to figure out how best to manage your coins while still trying to build the best wonder. I loved it! This is a review not a description of play. I enjoy the leaders expansion but believe Cities to be the best so far. It fits in well with the first game and feels as if it should have been included the first time. It adds another component of strategy without voiding any base game strategies. It compliments. Adds a minor essence of being cut throat and lets you effect all the players at times. Easy to learn for everyone who already knows how to play, yet adds a different feel to the game. Add a Review for "7 Wonders: Cities"